Commander Evans, R.N., prepared for South Pole. Recto: A black and white photograph within a black border showing Com. Evans in rather odd looking polar clothing. 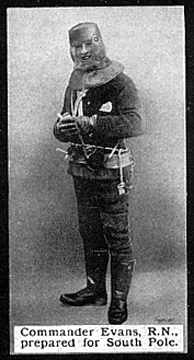 The caption reads: Commander Evans, R.N., prepared for South Pole.